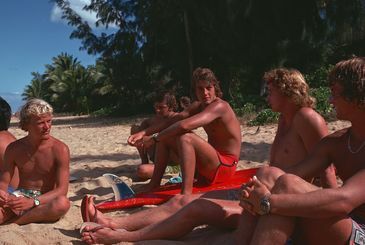 Director Jeremy Gosch‘s doc “Bustin’ Down the Door” spotlights surfing as a pastime to pro sport in the Hawaii scene of the 1970s. Co-written with wife, Monika Gosch and narrated by Edward Norton, the film takes a look at a group of young people who put it all on the line to create a phenomenon and an industry that is worth bilions of dollars today. “Bustin'” focuses on six surfers from Australia and South Africa who strived for recognition for their talents and surfings place in the imagination of the world. “Bustin’ Down the Door” opens in limited release Friday, July 25. I grew up acting, mostly commercials but some TV and films. My parents also had a production company that they started by fluke, so I worked with my parents shooting various projects. I learned editing and shooting while working for my parents. Growing up surfing, I got into snowboarding pretty early in the sport and wanted to make a film about it. So, my wife Monika and I wrote a screenplay and produced “Last Ride” on a budget of about $35,000 paid for entirely on our credit cards with a couple of “investors.” The film was pretty much Monika’s and my film school. We were able to get the film onto Showtime and you can still rent it on Netflix. I think the key there and my goal in filmmaking is being true to the project you are working on. The main thing you can say about “Last Ride” is that it is just a story about kids who snowboard, it’s not a cheesy Hollywood take on it. I was always disappointed with movies like “Point Break” or “North Shore,” where in one shot guys are surfing in Malibu and then they cut to them riding a wave and they are in Hawaii. It is just so untruthful. Making a film is a hard, hard process, but there is nothing else in this world that I could see pursuing. Just the joy and satisfaction of having all these tiny minute decisions all come together to make one a piece of art is so exhilarating. There are so many stories that I want to see told. How did the idea for “Bustin’ Down the Door” come about? Shaun Tomson and I had met several years before the idea for the film came about. I’m a surf-stoked kid growing up surfing and living in North Hollywood, a “val.” The thought of doing some project with the 1977 World Surfing Champion was terribly exciting to me, but our schedules kept anything from happening. Then in 2006, Monika and I started our production company, Fresh & Smoked with the sole purpose of doing projects we really wanted to do. The first project I pitched to Monika and Rob Traill, the other producer on the film, was “Bustin. '” I had read plenty of articles about Rabbit, Shaun and the guys and knew there was some sort of story there that we could do, I just didn’t really how deep it went. We approached Shaun and he thought it would be great and off we went. A scene from Jeremy Gosch’s “Bustin’ Down the Door.” Image courtesy of Screen Media Films. For me story is everything in film, and this truly is a great story about three years on the North Shore that changed surfing forever. Having never made a documentary, I didn’t want my filmmaking or art direction to get in the way of that. I wanted to keep it simple. Our interviews went very long with the guys, and I tried to set-up the feel of the conversations to be kind of like it might be if you were talling a story over a couple of beers on a surf trip. We also knew going into it that this time period was very well covered by a many talented filmmakers, making surf films on 16mm, so the imagery we had to draw from was immense. So basically I wanted to get out of the way of the storytelling and imagery and keep it simple and let those two elements drive the film. The biggest challenge was tracking down and getting a hold of all the stock footage that we needed. We watched about 50 surf films made in from the late ’60s to the early ’90s. Most people who made these films were surfers themselves, so the have their films stored in various places and on a multitude of formats. Doing interviews on the North Shore with surfers was very tough also. If there were good waves you could almost count on people not showing up for there interview time and we had only a two week period to capture all the interviews for the film. Yeah, I think making films is an ongoing journey and an ongoing learning process. My goal is to make films that make people feel, think and get into your head so you can’t stop thinking about it after you’ve watched it. I want to explore anything that is emerging with new technologies to be able to tell stories that have power and merit. Independent film is being able to have the opportunity to create your vision in an atmosphere that you set up. It is filmmaking in its purest sense, a filmmaker with a vision and a way to do it hopefully unencumbered by having to make sure the film makes money — film for the pure art of it. The thing I’m most proud of is getting “Bustin’ Down The Door” into theatres. I really thought going into this project we had the chance to see that happen. When you start with an idea, then raise the funds, shoot it, edit it, and then get an audience to react to it, it’s pretty much magical. I feel so lucky to have taken it this far.